In advance of Girls Night, I browsed through Guilford to put together my personal wishlist. Here are just a few tempting items; you’ll find so much more in town. Join us for our biggest Girls’ Night of the year on Thursday, December 6th from 5 – 9pm. 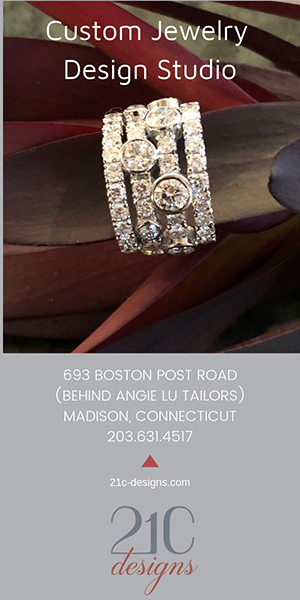 Meet The E List team between 5 and 6:30 pm at The Marketplace at Guilford Food Center for wine and beer specials and free hors-d’oeuvres, and to pick up your E List sticker to qualify for discounts. We are adding a second CHECK-IN location at Java Hut (20 Church Street) if you’d rather start your shopping at the top of the Green. Pick up stickers here as well and peruse the Quonset Hut shops. Then head out to the boutiques along The Green and take 20% off almost everything (some exclusions apply) at participating boutiques. 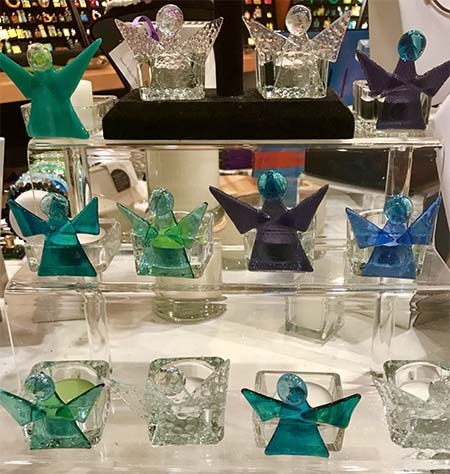 Make sure to stop at Artistry, Guilford Art Center’s annual artisan extravaganza on your way into Guilford, 411 Church Street (near the 95 exit). Every year, the Guilford Art Center fills the barn with over 250 American artisans featuring handmade works in all mediums. 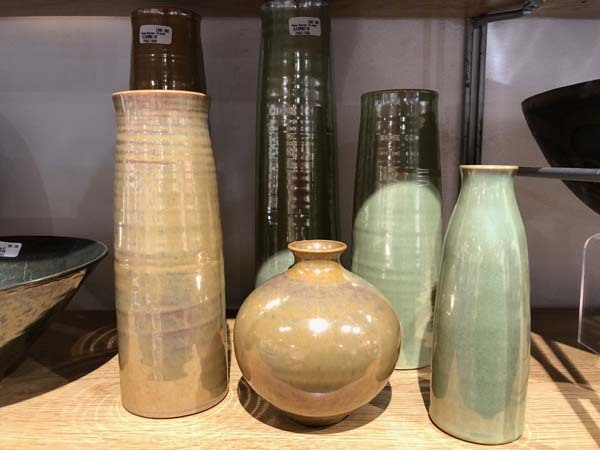 You’ll find ceramics, scarves, ornaments, toys, ties, leather bags and more curated by the team at Guilford Art Center. 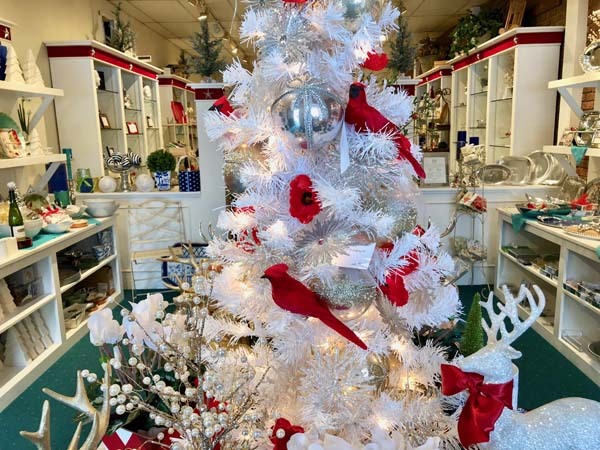 Check the website for special shopping events during the season. 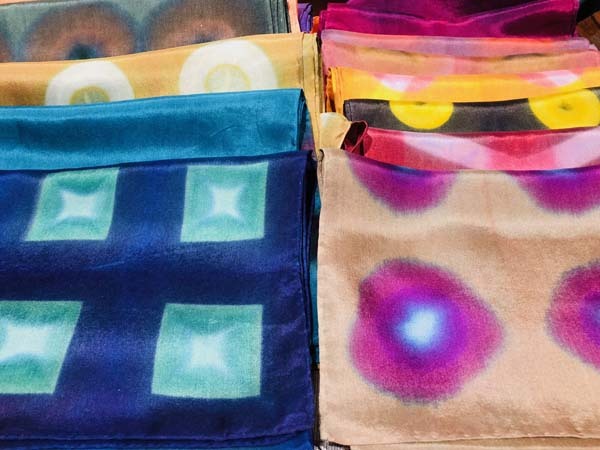 Love these luster-glazed pots and hand-dyed shibori silk scarves. If you miss an old-fashioned hardware store that carries everything under the sun, plus a knowledgeable staff that actually can help you find whatever it is you’re looking for, head straight to Page. Not only do they carry all the high-end appliances (like Sub-Zero, Asko and Wolfe), which unfortunately are not on sale during Girls Night, all the small appliances are! 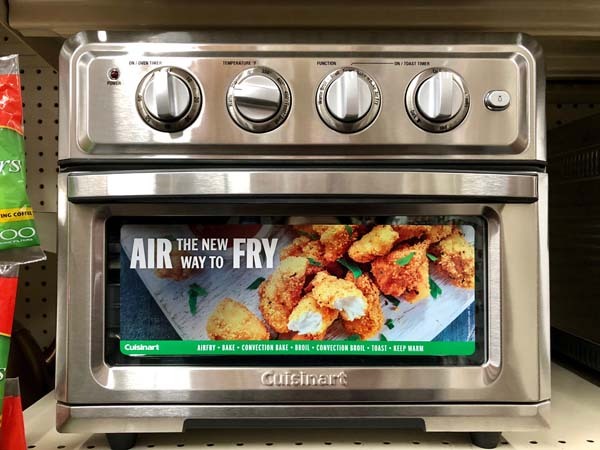 I’ve been dithering over a Breville Air Fryer for a while now and I just may take the plunge at Girls’ Night. Plus Instant Pots (have you seen our recipes? ), coffee makers, and so much more. Bakers especially will love it here. 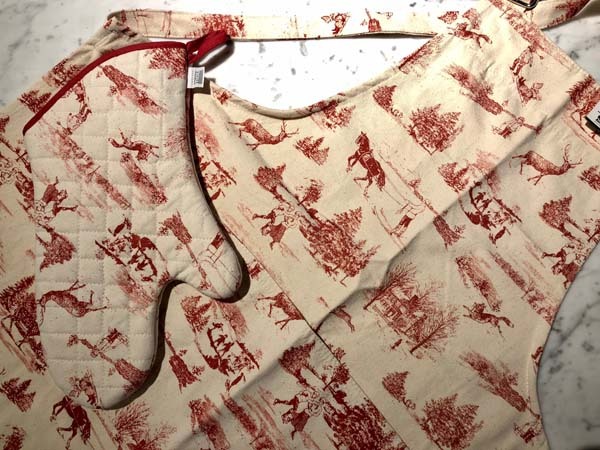 I love toile AND winter scenes and here we have the best of both! 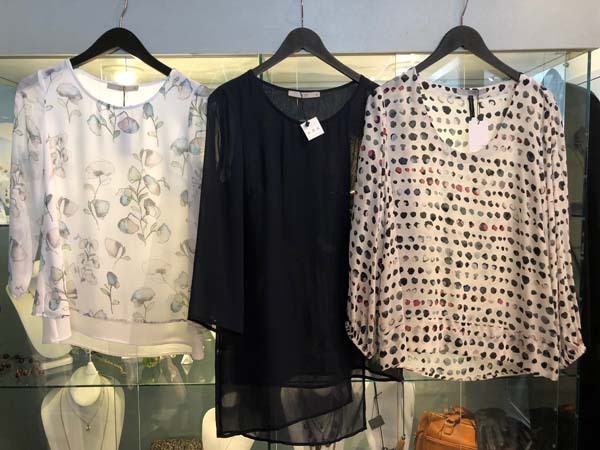 Tracy Brent Collections, 76 Broad Street – Tracy 2 and Tracy Coast & Country, 71 Whitfield Street. 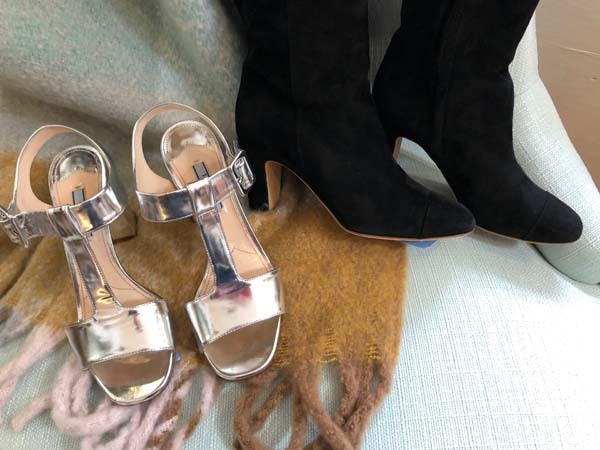 Most of us think of Tracy Brent as the destination for party dresses and contemporary sportswear, but it’s also a good spot for footwear. 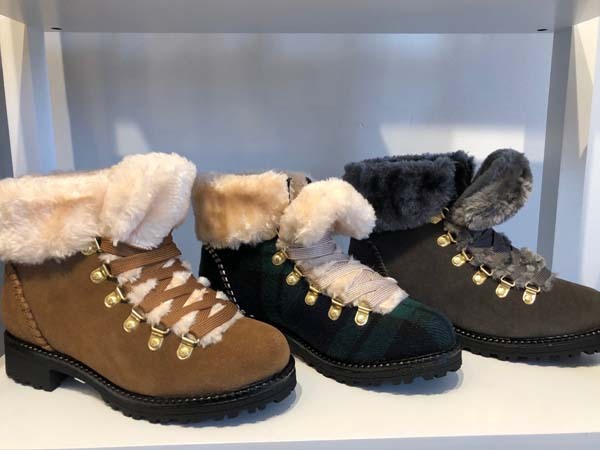 I’ve had my eye out for hiking boots, and these fuzzy ones by Jack Rogers (of all things) may be just the ticket. The black watch plaid is right on trend this season. Tracy has all THREE of her Guilford shops participating in Girls’ Night this year! 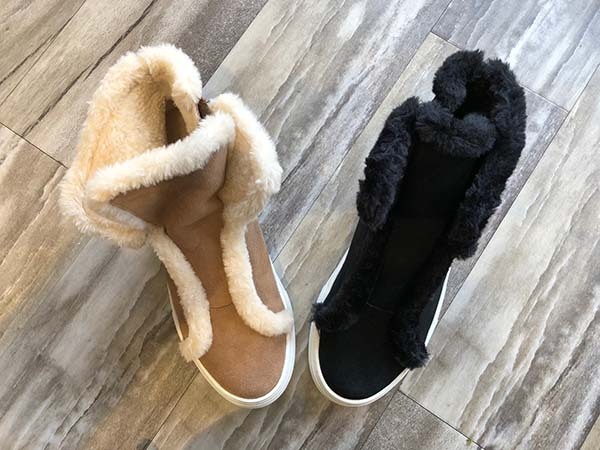 Pull on, side zip cozy sneaker boots! We’ve all got enough little black dresses in our closets and – news flash – purple looks great on everyone! 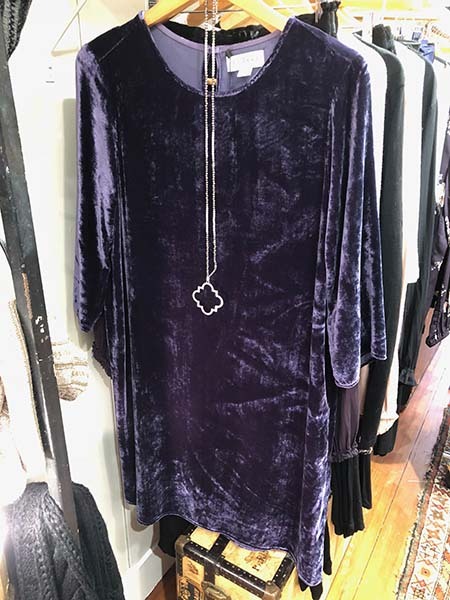 This velvet number (by Velvet) with chic 3/4 sleeves is an easy solution to holiday parties and events. 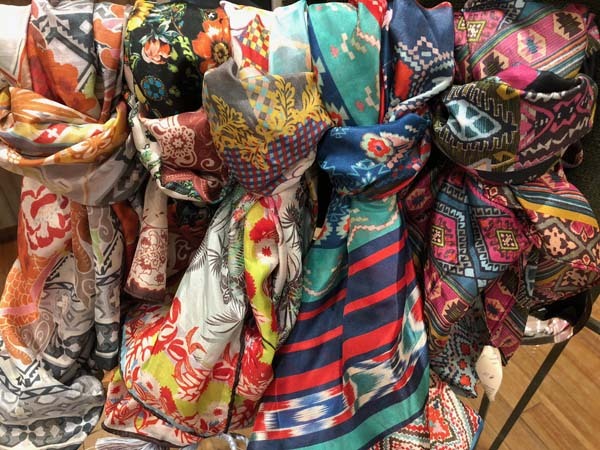 After seasons of solid scarves, print ones are looking fresh. I loved these silk versions by Johnny Was. Mix is known for modern design and new owner, Maggie Moffett, has kept to the formula. 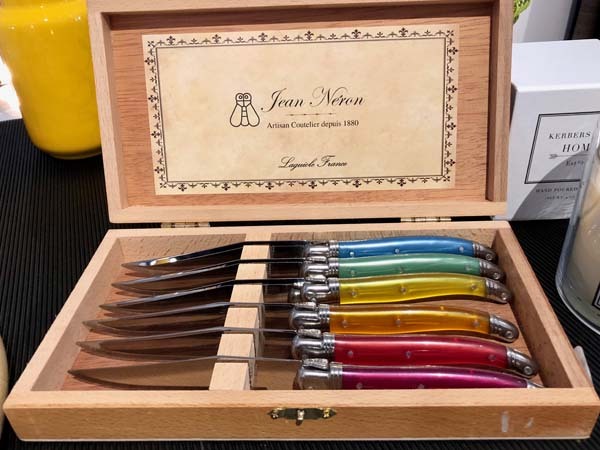 This is always my go-to spot for gifting, and this year I’m considering this rainbow-handled collection of classic Laguiole steak knives for any foodie on my list. Lost of fun kids gifts, too. From the perfect stretchy stirrup pant (yes, they’re back! ), to an entire wardrobe refresh, you’ll find it here. 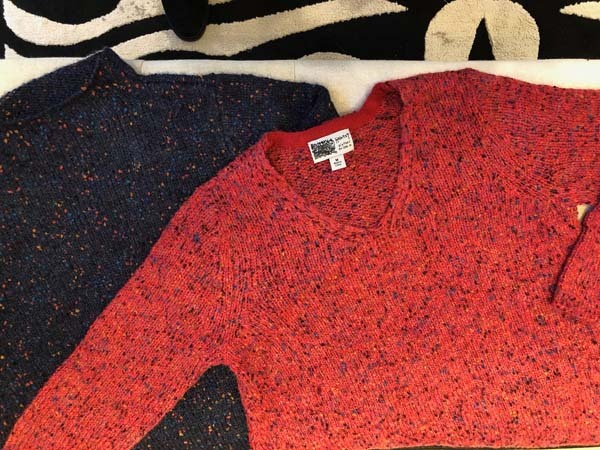 I especially liked these slouchy, under $100 speckled sweaters for the ladies on your list. 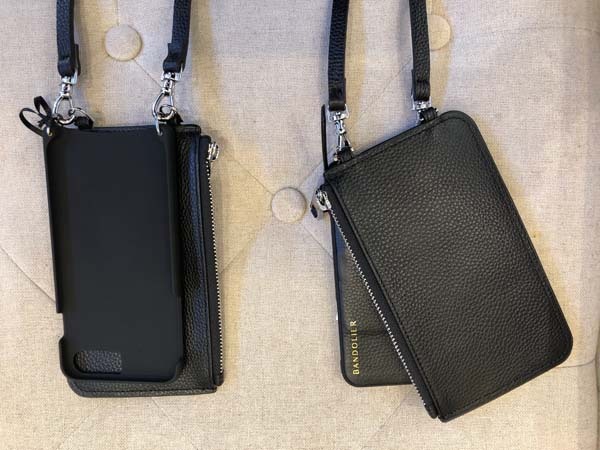 Plus, these Bandolier phone cases are genius. Pack your phone, a few cards, and a lipstick in this cross-body and out the door you go. We love how Details always dolls up for the holidays. You’ll be hard-hard-pressed not to winnow your list at this tempting shop. Candles, tabletop, guest soaps, Mariposa, and plenty of decorating ideas will provide tons of inspiration if you need a boost to your holiday mood. 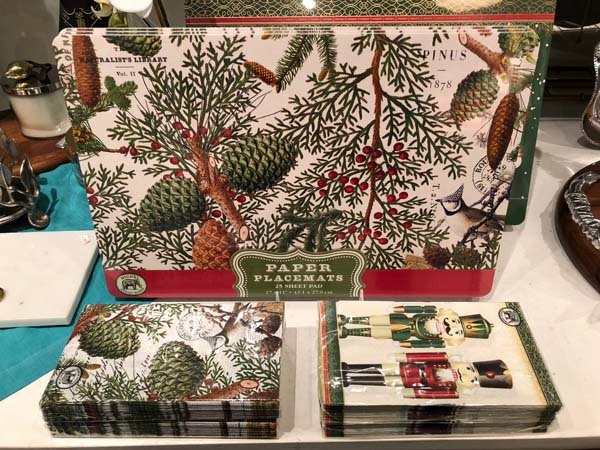 I especially loved these paper placemats and napkins for easy gatherings. You don’t have to browse the Real Real for designer consignement, just head to Marijane. I spied these fabulous suede, over-the-knee Chanel boots and party-ready Pradas! 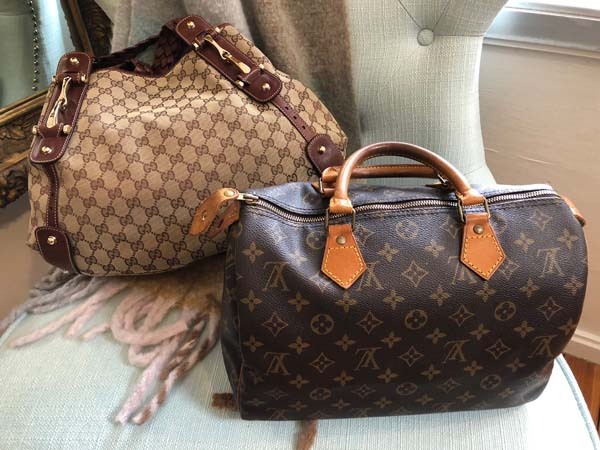 Chloe, Louis Vuitton, and Gucci are in the house, too. Sometimes a fancy blouse is all you need to whip up a holiday outfit (that’s my secret anyway!) and you’ll find plenty here. I loved the collection of chiffon blouses from Australian-based Ark. Lots of charming and well-priced baubles for gifting or getting, too. 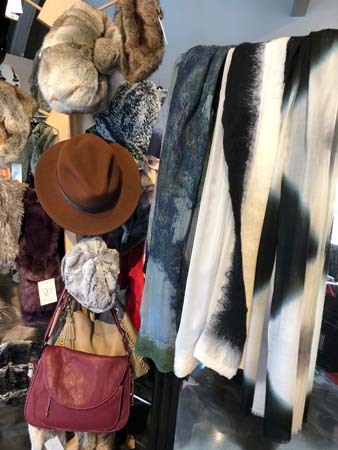 BSK Design will be transitioning from Chroma Gallery to the iconic Green Gallery in January of 2019, so that Barbara can combine the two passions in her life under the same roof: creating art and seeing her wellness/forgiveness clients. Barbara will still be making glass creations but she is expanding into the painting world in bold colorful designs, of course! The new space will offer workshops and lectures and provide a place of community where creativity and healing take place together. 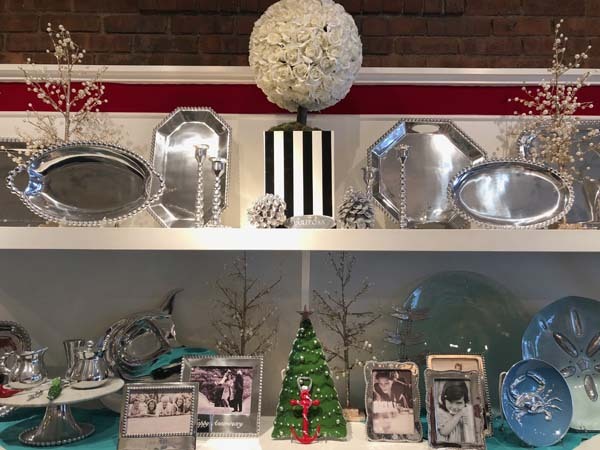 Head to BSK for a giant moving sale throughout December, and discover dichroic glass jewelry, beaded necklaces, Judaica, vases, platters and more, for holiday gifting or your holiday table. These are just a few of the shops participating. Click here to see the whole list of boutiques. No RSVP necessary for Girls Night Out, but if you’re planning on staying in town for dinner, make reservations. Girls’ Night Out in Essex 2014 Madison Girls’ Night Out 2015 Guilford Girls’ Night Out 2016 A Spring Girls’ Night Out in Guilford!